School is almost out! Many of you will be hitting the road this summer to visit friends and family out of state .... AND you just might be playing host to out-of-town company yourself! Make your guests feel welcome with a little hotel hospitality! Who doesn't like staying at a nice hotel or little inn and seeing the cute toiletries? You can do the same for your guests. 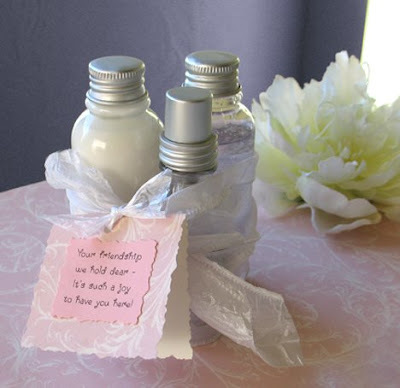 Fill petite bottles with your own favorite lotions, gels, shampoos, etc. or find nice sets at a department store. (With the airline limitations on liquids, small sizes are readily available.) Bundle the set with a ribbon and add a personalized note! It’s such a joy to have you here! Hi - I popped over from The Mom Blogs. I was intrigued by your avatar and just needed to get over here and take a look around. You have an absolutely gorgeous site, it is so clean and simple and if an site can be crisp, yours would be crisp. I could swear I smelled fragrance coming from my screen.